You'll be £14.99 closer to your next £10.00 credit when you purchase Voices from the Battle of the Bulge. What's this? After the Allies broke out from Normandy in July 1944, they drove quickly through the rest of France and were threatening the German border by the autumn. To halt the Allies, Hitler’s last throw of the dice was the massive gamble of a counter-attack in the Ardennes. The massive German attack launched on 16 December 1944 achieved complete surprise but heavy fighting in the American sectors, halted their advance after two days. Known as the Battle of the Bulge because of the bulge in the German lines at this point, a battle of attrition followed in the bitter winter weather but Allied air power and limited fuel supplies on the German side gradually turned the battle in the Allies favour and by mid-January German forces were in retreat. This had been the largest battle fought by the Americans in World War 2 and at the end of it Germany was facing its final defeat. 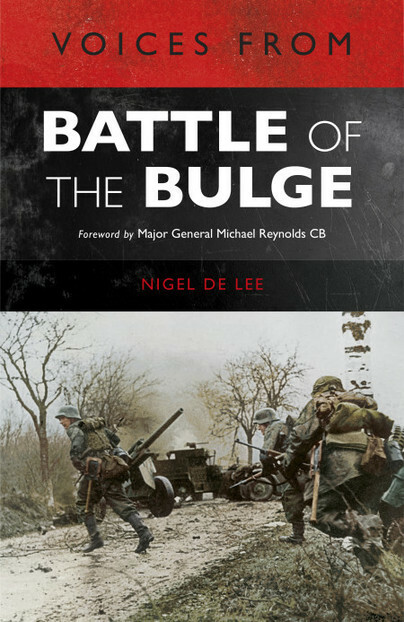 This new paperback edition of Voices of Battle of the Bulge tells the story of this pivotal battle of World War 2 through contemporary witnesses. Drawing on interviews, letters, diaries and eye-witness accounts from the military commanders and generals, ordinary front-line soldiers and civilians who experienced the Battle of the Bulge at first hand, it vividly brings to life and commemorates one of the key battles of World War 2. Nigel de Lee has taught war studies at Sandhurst, Camberley, history at the US Naval Academy, Annapolis, and Operations and Tactics at the Krigsskolen in Oslo as well as working for twenty years as an interviewer for the Imperial War Museum Sound Archive. He is currently teaching in the Politics Department at the University of Hull and is preparing to teach at the Joint Services Command and Staff College at Watchfield. He lives in Beverley, East Yorkshire.